The title of this book is a question asked by a professor of English and answered by a practising novelist. Apart from Milan Kundera, no other living writer has engaged with modern fiction with such depth of learning and lightness of touch. 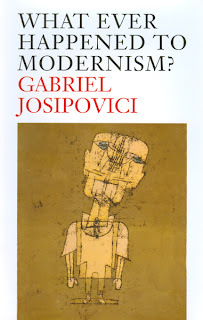 I have been reading Gabriel Josipovici's fiction and non-fiction for over twenty years but little prepared me for the sustained focus and force of this remarkable book. Until now his literary critical works have been collections of essays, even his book on the bible, The Book of God, is a series of discrete essays. Given this back catalogue which includes the lectures given at UCL and Oxford University, it's predictable that the new book has been characterised by some as an academic treatise rather than an accessible essay in the classic sense. The deceit needs to be countered not only because it is wrong but because it also confirms Josipovici's verdict on English literary culture as "narrow, provincial and smug". This can be demonstrated by bitter and dishonest reactions, as well as some more respectful if condescending assessments. However, there are rational reasons for resistance to the book's argument, even if they are expressed from the corner of the mouth. 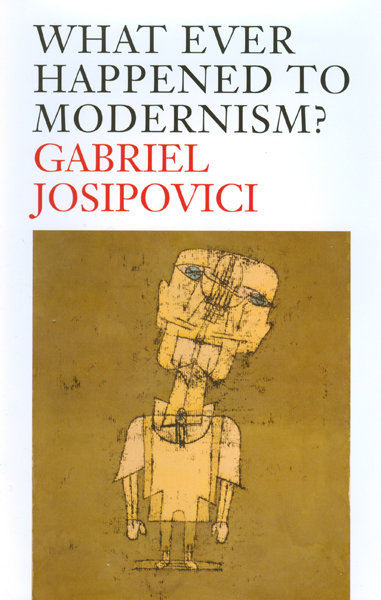 For Josipovici, Modernism reanimates the doubts and confusions about the authority of art that have been with us since the Enlightenment; doubts and confusion that he shows are present as dynamic forces in the great, paradigmatic works of western literature and essential to the reasons why they became great. For cultural gatekeepers, accommodating doubt and confusion rather than quelling their disruptive presence is anachronistic, the stuff of romantic legend or, worse, against the spirited positivity of modern culture. Peter Aspden says Modernism has "found its dancing shoes and lightened up". Surely literature is here to bring clarity and sense, to reveal the world in all its variety, intensity and, above all, reality? Perhaps. But this is an understanding from a watchtower, from outside of writing. When a novel, good or bad, is complete, it creates and embodies unity – even if it relies for this impression on stories of the ultimate rupture of terror, violence and death – and gratitude is expressed by the reader. For someone then to come along to point out that it is an artificial and constructed unity, we are bound to be irritated; yes, we know it is only a novel. Except, however commonsensical this statement may be, it has always to elide the uncanny experience of reading; the sense that it is only within the ideal space of the greatest novels that we feel most engaged with the world, where the doubts and confusions of our lives abate and we become able, for the time of reading at least, to maintain understanding and equilibrium. This is our gratitude but also our guilty secret. We know it is only a novel and the world has thereby been distorted and we need more art to maintain the illusion. Bad faith kindles doublethink. The problem for the critic is that this essential experience of reading cannot be easily discussed outside the special conditions bestowed by reading itself, removed from the pressures of commerce and fashion. The concealed problem explains why literary debate is dominated by personalities and political issues rather than an engagement with books themselves and why, as a consequence, attention turns to forms more congenial to disposable debate. Perhaps only a practising artist willing to analyse what's hidden can elaborate on the enduring presence of the forces of doubt and confusion. Josipovici's book certainly suggests this is the case and that only by recognising and embracing their urgency for each one of us – and not just as artists but as readers – can literary fiction renew itself both on the public and personal level. So, the book's purblind reception in England is really a symptom of an institutionalised instinct to repress and deny doubt and confusion. This is why in what follows I intend to address occasional misrepresentations of the book. Anyone who has read What Ever Happened to Modernism? cannot but be amazed at how some reviewers have deceived their readers in summarising the book as an attack on contemporary English novelists in favour of difficult, joyless avant-garde texts, while failing to mention the central theme of the book: the disenchantment of the world. For this reason, as best I can I shall summarise Josipovici's definition of Modernism before ending with a description of the quality or qualities of the art it seeks to encourage. Weber argued that the Reformation was part of a historical process, ‘the disenchantment of the world’, whereby the sacramental religion of the Middle Ages was transformed into a transcendental and intellectualised religion, which led to the removal of the numinous from everyday life. What was lost in this process is, for Josipovici, the elephant in the living room of modernity. "Weber’s argument is neutral" he adds, "but the assumption is that not only was this great historical shift inevitable, it was, since it ushered in the Enlightenment and helped to banish superstition, what the authors of 1066 and All That would have called A Good Thing." For Josipovici, unlike his enlightened critics, it is not necessarily A Good Thing. In the Middle Ages the notion that objects in the physical world were an allegory of the spiritual did not necessarily entail the representation of these objects as the signs of hidden truths. 'The mousetrap,' [says Schapiro] like other household objects, had first to be interesting as part of the extended visible world, before its theological significance could justify its presence in a religious picture.' However, even as a piece of still-life, the mousetrap is more than an object in a home: 'it takes its place beside the towel and the basin of water as an instrument of cleanliness or wholeness [...]'. What Schapiro is doing here [Josipovici writes] is to open our minds to the possibility that the alternatives are never simply either that objects are symbolic or that they are not: the very way the painter has brought them together makes objects in a naturalistic painting inevitably symbolic." This is what Weber means by the numinous: an interplay of physical and metaphysical that eliminates polarity. Transcendental and intellectualised religion polarised art and community with the consequences of a loss of heaven's guide and thereby the guarantee of a work's authority. How and why this happened is a question for other books. Nor does Josipovici claim this is his history: as well as Weber, he points to the examples of established European thinkers such as Hans Blumenberg, H-G Gadamer and Erich Heller of writers who have discussed the process and its consequences. In the main, however, What Ever Happened to Modernism? is a book about modern fiction. "[It] is no coincidence" he says "that the novel emerges at the very moment when the world is growing disenchanted". The Novel dramatises the emergence of the self not under God, yet who nevertheless seeks enchantment however secularly it is defined. The book's earliest example is Rabelais' Gargantua & Pantagruel but the most telling is perhaps Cervantes' Don Quixote. What Josipovici identifies as modern here is not only the comedic critique of the Knight's idealism but that the novel makes us aware that its critique relies on "the primal idealisation in the conception and execution of the very work in which the critique is made." The profound irony of Don Quixote is ... that as we read about the hero's obvious delusions we believe that we are more realistic about the world than he is, less enchanted, whereas we are of course ourselves in that very moment caught in Cervantes' web and enchanted by his tale. The novel's overt self-reflexive awareness of its status as an invention "dramatises the way we as readers collude in this game because we want, for the duration of our reading, to be part of a realised world, a world full of meaning and adventure, an enchanted world." This is both very clear and unsettling. As soon as we believe we're on firm ground, amused at the follies of others, we find that instead we were engaged in the biggest folly of all. English critics' inability to follow Cervantes' looping paths into such uncertainty leads them to celebrate the novel in their own Humanistic image. They can see the numinless utility of towels, basins and mousetraps but not what has been lost. It leads Philip Hensher to bluster that "it’s absurdly naive of Josipovici to think that [Dickens'] Bleak House could have been written without a constant self-questioning". Josipovici's point, which Hensher evidently refuses to see, is that doubt and self-questioning are present in Cervantes as part of the narration just as they are conspicuously absent in Dickens. Hensher demonstrates the blindspot in English fiction (with Sterne as its proving exception) and why, in turn, Josipovici defines modernism as "the coming into awareness by art of its precarious status and responsibilities". This is more or less where the inward debate of the authority of art begins. Even engaged in the most sober realism, [the simple past tense] reassures, because, thanks to it, the verb expresses an act which is closed, definite, substantive. The story [récit] has a name, it escapes the terror of a speech without limit. Reality grows thinner and becomes familiar. The elimination of the work's responsibility to the reality of its subject leads to 'a past without density, freed of the trembling of existence'. These stories, recognisable as a staple of mainstream English fiction, have nothing at stake except the mastery or otherwise of the novelist over his or her material; a mastery that is enough to convince many that what they're reading is great art. Yet, if this isn't enough, how can an artists inject the trembling of existence into art? Well, as Cervantes has demonstrated already, a very modern way is to place that question at the heart of the work itself. 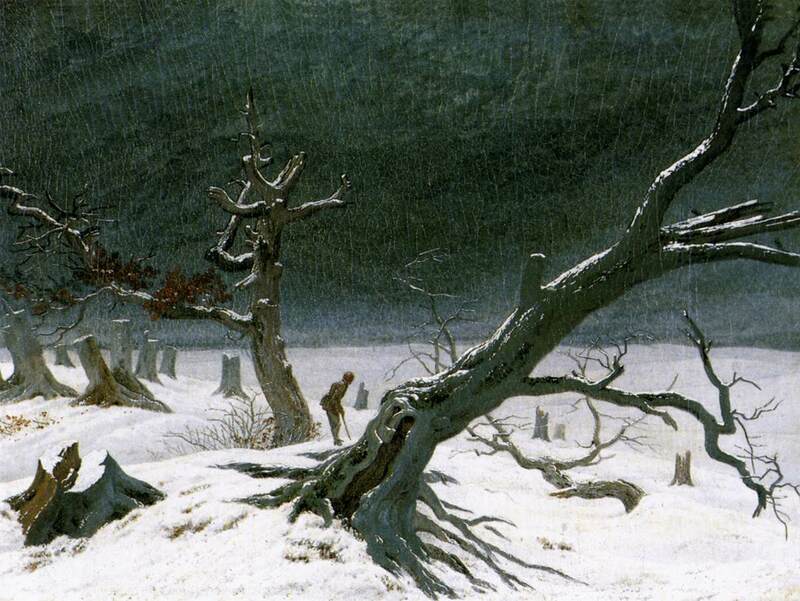 Josipovici uses Wordsworth's early poetry and Caspar David Friedrich's landscape paintings as further examples of where the question was raised. Both poet and painter are closely associated with the experience of nature and both can easily be categorised as comforts for aesthetes. What makes them modern and takes the story of Modernism forward is that both question the validity of turning an experience into art. They knew that the experience of nature is sublime because it overwhelms and transcends the individual consciousness, so, if one has the ability to write and to paint in response, to celebrate, to express awe, then that sublimity is thereby obscured and perhaps even denied. How can a work of art claim authority when only its absence could do justice to what has been glimpsed while wandering lonely as a cloud? We can go further and apply the questions of art to the individual. It seems only self-annihilation can express fully what has been sensed: death is present yet beyond comprehension and direct representation. Josipovici shows how Friedrich and Wordsworth place the question of experience and the representation of nature at the centre of the work. Friedrich's distinctive human figure within a vast landscape stands for the viewer viewing, the painter painting and thereby the limits of our vision, and Wordsworth describes the dialectical process of a vision of the moon and clouds during a late night walk. The contrast again enables the experience to be sensed in its obscurity and distance rather than as merely a sentimental gesture toward the unknown. And again, as in Don Quixote, the self-consciousness and reflexivity usually associated with the insouciance of postmodernism appears here in more subtle, troubled form. "Friedrich and Wordsworth", Josipovici says in a memorable sentence, "are not so much visionaries as explorers of what it means to see and what it means to paint or write". By presenting diverse figures as Rabelais and Cervantes, and Romantics like Wordsworth and Friedrich alongside the Modernists of the 20th Century, Josipovici may seem to be diluting the radical power of Modernism. One soon begins to wonder about the unique qualities of modern art and literature. Perhaps, however, this is a positive. It emphasises the longue durée necessary for a proper understanding of how and why, according to Virginia Woolf, human nature changed in or about December 1910, as well as to reveal the deep tradition Modernism follows and in which we still move. An understanding such as this may thus provoke a revolutionary revision of the time in literary history – the Victorian era – that has otherwise seriously occluded English perceptions of art. Still today, as Josipovici has often lamented, English novelists wish to write like Dickens as if this were the pinnacle of literary achievement; the end of literary history. Dickens' novels are frequently used as examples of the compatibility of a mass readership and literary greatness while authors such as Amanda Craig and Ian Rankin receive widespread attention and praise for promoting fiction as a neo-Dickensian form of journalism, reporting on current affairs without the constraints of fact. The only surprise is that the major awards for 2009 went to a huge historical novel instead, perhaps indicating where the true feelings of English critics lie; real life preferred at a comfortable distance. Despite this, Josipovici's critique of Dickens is unexpectedly mild. After comparing the wish-fulfilling coincidences that "oil the wheels of the plot" of Oliver Twist with the terrifying trajectory of Kleist's Michael Kohlhaas, in which injustice and terror are not redeemed or resolved by God or plot, he concludes: "Whether [Dickens' coincidences] are merely a small example of bad faith and a price worth paying, or whether the cost in terms of repression and falsification is simply too great, is a question each reader has to answer for himself." Repression and falsification, however, are not so easily noticed let alone resisted by the self. Kafka notes the "heartlessness behind [Dickens'] sentimentally overflowing style" and, as Oscar Wilde said, sentimentality is "the luxury of an emotion without paying for it". Dickens stands out as the obvious antagonist to writers who were not seduced by the guarantee of popular acclaim. Rather than the masses, they sought to exclude only repression and falsification. We need art to expose itself; to be, as Kafka said, the axe for the frozen sea inside us. Art's failure to be the axe, its settling down happily into the modern era of entertainment and commerce, spread dissatisfaction among artists with higher standards. This is why we should regard Modernism not as a period in artistic history but as a molten rock lurking beneath the surface, occasionally erupting into the landscape of culture. What causes its eruption is a big question but, in short, we may see the complacency of contemporary fiction, the fuss of its competing genres and its succumbing to commercial pressures from television, cinema and the internet, as promising potential for another explosion. Josipovici cites Kierkegaard's opposition of possibility and necessity as key to "the troubled heart and soul of 19-C man," that led to the last great eruption, the man "who has been given freedom twice over, first by God and then by the French Revolution, but who does not know what to do with it except torment himself with the sense that he is wasting his life." For artists at the turn of the 19th and 20th centuries, one answer was to eliminate the freedom of possibility, for the art that they made to be a necessary object in the world. By taking the constraints of art to the extreme, removing artistic choice and wish-fulfilment as much as possible, something else, something unexpected may appear. (Of course the Surrealists pursued the same end by doing the opposite, but this amounts to the same thing). Josipovici's prime examples are Mallarmé whose words in Un Coup de Dés are (in Malcolm Bowie's description) "a gravitational centre around which possible meanings of the entire sentence gathers", and Marcel Duchamp who presented the bare implications of art's arbitrary nature by entering a readymade Fountain into a show. Though neither are mentioned by Josipovici, we might add Schoenberg's development of twelve-note composition and Joyce's arrangement of Ulysses' diversity around Homer's Odyssey as if to open the everyday of 20th Century Dublin to Epic enchantment. Josipovici's favourite example is Georges Perec's Life A User's Manual, the classic of OuLiPo constraint discussed at length in the 1992 collection Text & Voice. The danger with these examples is that they soon become monuments for lesser artists to adopt and then claim their forerunners' radicalism as an alibi. 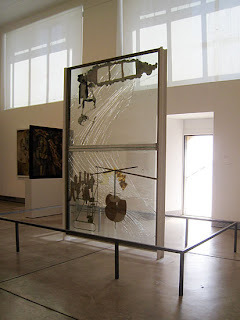 We see this most clearly with Duchamp in contemporary visual art and in compendious novels "about" a city or a nation. While Josipovici argues that the novel emerged when the world was growing disenchanted, the implication suggesting itself to the contemporary reader is that the novel is itself irredeemably generic and that its fake enchantments have embedded themselves so firmly in familiar forms that a resurgent modernism is almost unthinkable. The perennial debate about the exclusion of Crime novels, SF and Romantic fiction from literary prize shortlists, and David Shields' call for more unpolished fact in novels and less generic invention, confirms the impression. The literary novel has itself become a genre and the room for manoeuvre pitifully limited. So what new form can Modernism take? Josipovici's answer to this conundrum is surprisingly inclusive: it takes as many forms as there are artists. As an example of Modernism's variety of forms, he chooses Wallace Stevens' character Crispin, Kafka's horse Bucephalos and Duchamp's The Bride Stripped Bare By Her Bachelors, Even as "sad clowns" who each found their own ways to live within the condition of loss. Each form – poem, story, sculpture – pursues a similar awareness of failure and absence without falling into despair. Bucephalos was once Alexander the Great's warhorse but now, in Kafka's story, he's seen trotting up the steps of the courthouse in his new role as an advocate. Having no king to carry, he has studied law books by lamplight and changed his career. Perhaps, the narrator says, this is the best thing we can all do in post-heroic age. While there is no "formal experiment and linguistic daring" here, it maintains a contact with an enchanted past by means of its absence. So, in addition to Rabelais and Cervantes, these three make it all the more bizarre that Ian Jack assumes the book wishes for punishing difficulty and Max Dunbar for "some monochrome wasteland, with a Beckett-style narrative intone of disjointed words and phrases and perhaps the odd glimpse of Afganistan [sic] drone attacks flashing up on the screen". The hero of Greek tragedy was not an autonomous individual. He was caught in and made by a whole web of different interpenetrating elements. These were what led to tragedy but also what absolved him from full responsibility. Terrible things might happen to him, but he could not blame himself, or, to put it in terms of Greek tragedy itself, he might be polluted but he was not guilty. In modern tragedy, on the other hand, ‘the hero stands or falls entirely on his own acts’. Tragic drama, then, was, as Aristotle wrote, "an imitation not of human beings but of action and life". It's significant that Josipovici quotes here the critic John Jones on the mistranslations of the plays by Romantic scholars who could only see solitary individuals in their isolation, a tragic hero like Hamlet, at the centre of the story. Like our contemporary critics, they read what isn't there because they can see only personalities and the weighing of personal responsibility. It's a habit of mind we see in conventional fiction beginning and ending in a solitary consciousness even as it is reported in the third person, and also in the persistent contempt for the Nouveau Roman which presents description as an experience in itself; not about something, it is that something itself. To receive its gifts, Josipovici urges us to abandon "our mistaken search for what lies behind instead of focusing on what lies before us" and thereby learn "to live with impenetrability, to relax and savour it". However, even this straightforward chapter causes Sam Leith in The Sunday Times to criticise Josipovici for arguing for Euripides as a "proto-modernist" when he's doing the exact opposite. As the comparison above makes clear, Euripides was the Dickens of his time, Sophocles the Beckett. Why this kind of misreading continues is an issue worth pursuing. The dominance of reason and humanism in English culture, wedded to an awed reverence for commercial success, is one obvious cause. What cannot be said is not so much passed over in silence by contemporary culture as ignored or branded out of order. In his original lecture, Josipovici wondered if this cultural narrow-mindedness (he calls it innocence) is because, unlike most European nations, England was never invaded or occupied (at least not since 1066) and is intolerant of the compromises and ambiguities occupation demands. I would add that English culture has also never appreciated what Maurice Blanchot called "the absolute event" of the Nazi holocaust; in London, the positivity of the Enlightenment still reigns. To resist this dominance, we need to isolate the alternatives What Ever Happened to Modernism? suggests. With the two lists of features of Greek theatre in mind, we can appreciate Nietzsche's recognition of the subtle but drastic transitions in a culture. Our experience has always been one of being torn between the two forces of 19th and 20th Century art. However, dissatisfaction with the conservatism of many well-known practitioners of the novel (Ian McEwan's Saturday being the prime exhibit) may provoke another distinct era of destructive Modernist renewal. Not that this should concern us; individual works matter more than movements. And Josipovici's contention is that exceptional, breath-giving works are present anyway; it's just a matter of recognising them. He lists relatively neglected authors in his article in The New Statesman and the final chapter of What Ever Happened to Modernism? contains as much criticism of literary critics for hyping middlebrow novels by Irène Némirovsky as it does the works of contemporary English novelists. In transit from Philadelphia to New York ... the two glass panels, which had been laid one on top of the other and not well enough insulated from each other, ground against each other and, when the work was removed from its packaging on arrival, both panels were found to be shattered. Duchamp was immediately summoned to see if he could repair the damage, but when he looked at it he let out a whoop of joy, for the work now had a giant rainbow of cracks on the top panel mirrored by a similar pattern on the lower one. And one can see why he was so delighted. For years he had been trying to bring chance into his work, but chance brought in by the artist is never exactly chance. Now chance had led to an unexpected copulation in the back of a van and the result was a beautiful pattern which bound the top panel to the lower, while, amazingly, leaving all the main elements of the object perfectly visible and the whole still capable of standing up. He could not have asked for more from the gods. [...] Today far more visitors see Richard Hamilton’s copy (made for the great English Duchamp exhibition of 1966, since the Large Glass could never be moved again) than ever see the original in Philadelphia. They think they are seeing it all, but of course they are not. The work they see is still very beautiful – but it is, somehow, dead. In Philadelphia, with its rainbow shatterings, it lives. This passage is central to Josipovici's manifesto. When he made the news for saying English literary culture is permeated by "petty-bourgeois uptightness," a "terror of not being in control," and a "schoolboy desire to boast and to shock" he could also be describing Marcel Duchamp but for this element of chance, the ghost of the outside haunting the solipsism of the work. 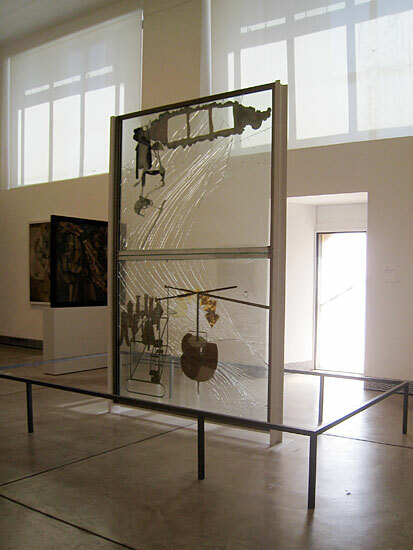 Again, one can easily imagine his smug critics giggling at the news of the panel breakage, perhaps labelling it God's wrath at the pretentions of modern art, at best an unfortunate accident that has ruined a potential masterpiece. However, for the viewer alone before the object, the experience is different to its public expression. The experience is also different for the reader of fiction. Josipovici has spoken of the unique, living quality of fiction which, he says, "has something to do with time, with how human beings respond to time, with what time does to us, the losses it brings, and the sense of possibilities unrealized, but also the Proustian sense of sudden loops in time and the way our lives are sealed off to us but suddenly, in time, open up momentarily.” While he says this in a brief interview, it features throughout his critical writing. In What Ever Happened to Modernism? it features as the possible re-enchantment of the world through a reckoning with what disappeared in the nightmare of reason. Always he has championed fiction that breaks through layers of self-protection – the self of the work and the self of the reader – to reveal loss without nostalgia and potential without self-deceit. Proust's In Search of Lost Time is Josipovici's keenest example and so it is appropriate that the first essay of his first essay collection The World and the Book is an essay on Proust's novel: "the most subtle, tenacious and profound exploration ... ever undertaken" of the relation between the writer and what is written. Still, I feel this is aspect of fiction requires more attention than What Ever Happened to Modernism? is prepared or able to give it, to become the overt subject of a book rather than left to the margins. But perhaps this is why Josipovici writes fiction and why we should turn to his novels and short stories for more. 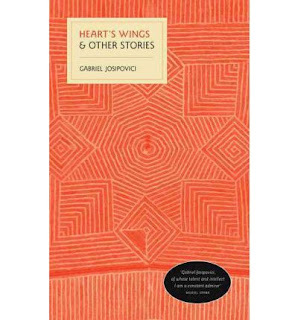 The new collection Heart's Wings & Other Stories is an ideal place to start. Thank you: at last an intelligent and incisive review of this book (& as it deserves!). This was just brilliant. And very necessary--it serves as a lucid, though perhaps solitary analysis of Josipovici's work. Very nice review. Still having not read it, I feel I have a better sense of what the book actually does now. Whilst reading this review I was constantly thinking how well Lukács' Theory of the Novel might complement WEHM, and given L's later political trajectory it offers some interesting points of comparison. The main difference seems to be this: what Josipovici perceives as a historical problem to be embodied by art and to be acquiesced to, Lukács sees as a historical problem to be both embodied by art (though, of course, he would opt for a particular type of realism) and sublated by revolutionary action. In fact, I was surprised that you wrote the phrase 'loss without nostalgia' in terms of what Josipovici requires from fiction, because my initial sense on reading him (first chapters of On Trust) is very much that of a nostalgia for a pre-disenchantment age. Now I see that it's not the nostalgia I'm uncomfortable with, but rather the stoic passivity; it feels rather like a superficial radicalism which, at root, is secretly very conservative. Hence such sentences as learning "to live with impenetrability, to relax and savour it." Here, I'd opt for a Lukácsian proactivity over a resigned and 'wise' submission. In other words, whilst it's possible to criticise Josipovici from the boring British McEwan perspective, it might also be possible to do so from a much more radical terrain - more radical even than J himself. But that's all based on this review, not on having read the book or his fiction. So I'll do that when I have time. Thanks Daniel. This is a criticism I've heard elsewhere in correspondence and it's difficult for me to address because the revolutionary action you speak is separate from writing and very much part of the larger whole What Ever Happened to Modernism? addresses. For this reason, theologians and philosophers would offer similar criticisms from their own perspective, as if Josipovici were addressing them and not the issues presented in the book. page 58: "Literature represents a power of a particular sort that perhaps does not have to do with possibility: art is infinite contestation, contestation of itself and contestation of other forms of power – and this is not only in simple anarchy, but in the free quest for original power that art and literature represent (power without power)". Josipovici's essay "Memory: Too little / Too much" in The Singer on the Shore may also go some way to putting your impression of conservatism in context. Thanks for an enlightening take on WEHM. My appetite whetted, I plan to dig in. This is the epitome of what a review should be.